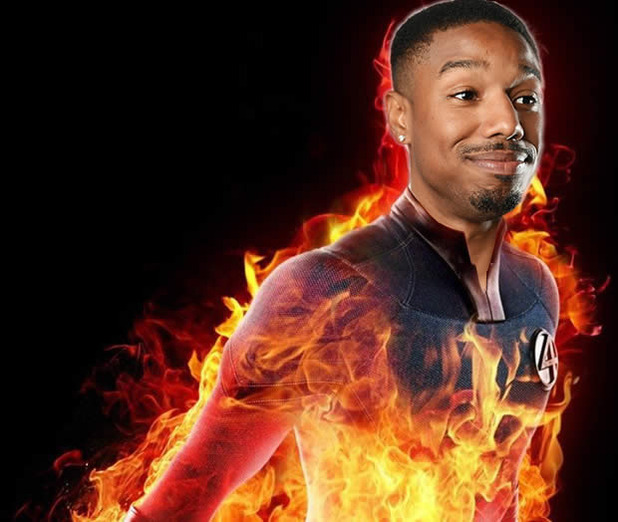 When news broke that Michael B. Jordan would be playing Johnny Storm in the Fantastic 4 reboot, the internets went plum nuts. “How can this be?” they asked. “Johnny Storm ain’t black!” they bemoaned. “Sacrilege!” they exclaimed. And this is all true. But everyone needs to cool their jets. Just like that TLC biopic, we all need to stop rushing to judgment without knowing all the facts. In the spirit of fairness, I’ll present cases for and against Jordan’s portrayal of the Human Torch. And in the end, I’ll issue my verdict to put an end to the psychosis. 1. Johnny Storm is white in the comics so he should be white in the film. 2. If Johnny Storm is black, how is his sister white? It is clear here that the detractors have one main problem with Jordan’s casting: his skin color. Not that this is an invalid point though. The argument that he has been portrayed as he has always been shown in the comics is a strong one. It is also a tough one to fault. But what about if we looked at the reverse? What about other films that have been made where a white person portrayed a character meant to be another race? Rolling Out magazine highlighted a number of films where this was the case, most notably Johnny Depp in The Lone Ranger, Angelina Jolie in A Mighty Heart, and Jennifer Lawrence in The Hunger Games. Why were those portrayals OK while this one is not? The main difference is that the ethnicity of the characters were not changed; instead, the actors worked to portray a character with that ethnicity. In the case of Fantastic Four, the film itself is changing the ethnicity of the character. And that is something different entirely. Such a big change is a bright, glaring sign that the movie is making a major shift away from tradition. And that, not just his skin color alone, could be cause for concern. Following that same line of thinking, a major question hanging over this film is how you reconcile having Sue and Johnny Storm, siblings from the comics, have different ethnicities. Is one of them adopted now? Are they “play cousins”? Are they even still related? No matter the answer, it is clearly not how it has always been in the comics. This isn’t necessarily a bad thing. Once that issue is reconciled, any classic F4 story could be told without undermining the core of the team. But the most interesting question to ask here is, why? Why change Johnny’s ethnicity? Why not cast a white actor? Was this intentional, as in this was already built into the script? Or was this change made to accommodate a big name actor? Unfortunately, we may never get those answers. 1. Jordan is an excellent actor that will be able to bring complexity to the role. 2. This move brings diversity to a story that has mainly been whitewashed. 3. In this take on the classic story, his ethnicity won’t detract from the overall themes. The upcoming Fantastic Four reboot desperately needs to set itself apart from the prior set of largely disappointing films. What better way that to zig where the F4 have always zagged? Though the fantastic ones have been a part of Marvel canon since forever and have fought everyone from Mole Men to universe destroying gods, the comic is not exactly known for its diversity. There have been part-time/replacement members that were non-white, but that never lasted long. Pulling in a big name/highly accomplished actor like Jordan brings in huge publicity while recreating the story for the modern age. Many detractors cry that using a black actor for a white role is just plain wrong. Some have even been known to make the false equivalency of comparing this to a white actor playing a black comic character. The problem with this notion is that the overwhelming majority of comic characters are white. Only a few (i.e. Luke Cage, Storm, Black Panther) have really grown to become big names and maintain a long time presence. White people don’t really lose if someone black takes the part. You can’t say the same in reverse. And if nothing else, Marvel’s string of successful films that defy comic canon are proof that breaking from tradition isn’t always a bad thing. Just because the Human Torch is black now doesn’t mean that his personality will be radically different or that the essence of the character will now be gone. Jordan can be just as obnoxious, silly, and loveable as a white man. He can still have the same sibling bond to Sue that is prevalent in the comics. None of that is exed out by his race. It’s time for us die-hard comic fans to read the leaves. Comic book movies are NOT made for us. They are made for the masses. We can hold on to our mint quality first editions and cry foul all we want, but the goal of these films is to make money. It’s not about giving us our favorite stories on movie form. This case perfectly articulates this point. Comic traditionalists might not like this change, but I can guarantee you that it will put butts in seats with buckets of popcorn in hand. The Fantastic Four is one of the most classic and beloved of the Marvel properties, and as such, any portrayal inspired by the comic should try to emulate it as much as possible. And that is my hope for this movie, no matter the ethnicity of the characters. As far as I can see, the only issue that really needs to be wrinkled out is how Johnny and Sue are related, something that is easily, quickly, and seamlessly handled. This judge rules in favor of the defendants. There was a time when everyone said we weren’t ready for a black president, and then Barack Obama punched that notion in the nose. Michael B. Jordan might just be doing the same for comic book movies. Though playing a man who can light himself on fire pales in comparison to leading the free world, you get my gist. I know that I’ll be watching the film opening weekend regardless of the reviews. If having Johnny Storm be a black man is enough to turn you away, I’m sure the studio has already decided that they don’t care. And let’s be honest; this movie can’t be worse than either of those last Fantastic Four movies.